Any verdict on the quality of the actual film aside, Blair Witch is the surprise of the year. It may not be as groundbreaking as when The Blair Witch Project stunned audiences at the 1999 Sundance Film Festival or even when the film stampeded through movie theaters later that summer. The controversy and marketing behind it had something to do with that, but the surprises involved with this latest film, simply called Blair Witch, are undeniable. Thank Adam Wingard and Simon Barrett for this. Their mark on the indie horror scene has definitely been made with hit films like You're Next, The Guest, as well as the V/H/S pair of anthologies. There doesn't seem to be a more perfect union between filmmakers and project, and the level of scares Blair Witch delivers are among the biggest surprises the film has to offer. First among the big surprises, though, came with the announcement of what the new film from Wingard and Barrett actually was. Originally made under the title The Woods, the film during production – and well into post-production – was presented as a wholly original new entry into the found footage, horror genre. The truth was far more interesting. The story of a small group of friends venturing into an uncharted batch of forest and encountering the horrors that lie within is pretty straightforward as far as this sub-genre goes, but having that story connect to the film that began this whole found footage craze was a nice swerve that took the sub-genre back to those viral marketing roots that grew out of The Blair Witch Project in 1999. That small group of outsiders this time around is made up of James (James Allen McCune), Lisa (Callie Hernandez), Ashley (Corbin Reid), Peter (Brandon Scott), and a pair of local residents: Lane (Wes Robinson) and Talia (Valorie Curry). After seeing footage of what he believes to be his long-lost sister, Heather (Heather Donahue of the original 1999 film), James becomes convinced his sibling is still alive, trapped somewhere in the Black Hills of Maryland. James sets out with his friends, one of whom is a film student making a documentary based on his search for Heather and equipped with all the latest camera gear a small group would need to make a film in the rural area. Needless to say, the trek through the Black Hills becomes an ever-increasing nightmare for all of them. It's in the film's scares where Blair Witch absolutely gets the tone right. Wingard and Barrett have more than proven themselves in this department, and their ability to get under the audience's skin becomes all the more apparent as their film progresses. The original Blair Witch Project was not only a suspenseful and eerie look at the breakdown of a group when they're lost, alone, and completely at their emotional and physical end. Filmmakers Eduardo Sanchez and Daniel Myrick nailed it that first time out, so much so that the slate of found footage movies that followed seemed endless, with eventually more parodies than serious entries finding their way to release. All sense of parody has been set aside but not without leaving something of a sense of humor. This helps flesh out the characters whose point of view we're witnessing as the world seems to crumble around them, the cameras strapped to the sides of their head, so there's little being missed this time around and even less questioning of why anyone is filming. You're never quite sure where the next bout of madness or chaos is going to reveal itself, and Wingard's use of the camera (drones for some aerial footage included) presents a suitable atmosphere for every scene. 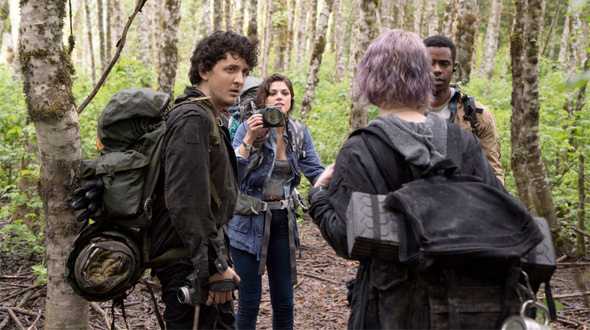 Wingard and Barrett's new Blair Witch ultimately proves itself as an honorable reflection of its predecessor as well as the found footage sub-genre as a whole. The view from the camera moves in all directions at any angle possible and it's up to the viewer to keep up with the chaotic menagerie of horrifying things and dark, dismal places. The jump scares come as often and as effective as the subtle changes in the film's soundtrack that leave an unnerving feeling in the viewer's stomach. It's all turned up to the max with Blair Witch, though, and the excitement and intensity left behind in the wake of those scares is sure to entice even the most jaded of fans. The laurels the film rests on are hard and heavy, and with Wingard and Barrett in control of an effective execution of these elements, there's quite a few number of high points by which fans of the genre will be entertained. Blair Witch's presence may not be what the found footage film genre needs at this point, but it accomplishes the haunted house look and feel that's been missing from the sub-genre for so long. 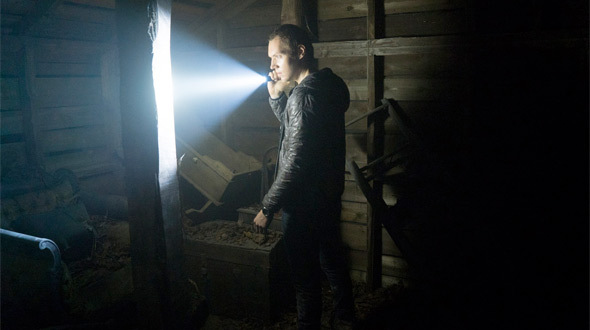 Simply for the way it jolts and thrills you, Blair Witch is a horror experience worth taking. This is by far the best review I've seen of this film. I want it to be good but it seems like a tall order. Twas good. I think it would have been better received if they kept the old name. Yesterday i did see the conjuring 2 and it was damn creepy and scary and just as good as the first one. So a sequel can be just as good as his predecessor. I think the conjuring 2 might have even outdone the first. Both fantastic films. Agreed. The first one was not scary to me. Something about seeing Farmiga's amazing eyes hypnotizes me from being too scared. his movies are very detailed ,well written and always choosing the right actors.If you think the conjuring 1 and 2 aren't scary maybe the horror genre isn't your thing.It's about scarejumps and the right timing,and his timing is flawless.I see alott of horror movies,maybe my favorite genre besides science fiction,because you can't fool people with allot of cgi or special effects,it are in basis very simple movies but very hard to make.. Conjuring 2 was boring and the same retread of every horror movie Wan makes. If you want the real story behind the story of Conjuring, watch the Haunting of Enfield. It's a 3 episode mini series. I was going to take this review with a huge grain of salt until I read the review in the Globe And Mail. They pretty much hate everything and gave this 4 and half stars out of five. Now it's on my must-see list. Have to wait for the blu-ray though. DIG. I thought it was pretty F'ing scary. I would have loved it to be scarier (INSIDIOUS, is my current champ), but it was still way scarier than the original, which I thought was kinda scary. That scene in Insidious, when the mother is outside looking in, and sees the child's sillhouette dancing to that old-timey music...So creepy. Love that flick. Please...I am cold sweating now. I'm glad it's decent, especially since I seem to be one of the few people who actually enjoys the original. I'll have to check this out. What the hell is going on? Before it even played at TIFF, I heard rave reviews about this sequel. Then it got buried. It only made 9 mill opening weekend on top of that. But a lot of critics are still saying it's scary. I'm seeing it tonight. Watched the original again last night. Still effective. Did we watch the same movie? It was boring as hell and completely predictable. Just saw it. Holy crap that was bad. Wingard is dead to me just like how Aja is dead to me after Haute Tension.